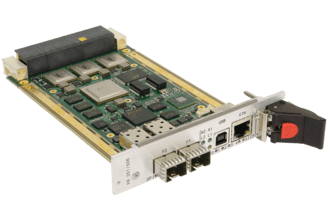 September 2016 – Concurrent Technologies announces FR 351/m06, a new 3U VPX™ switch with 10 Gigabit Ethernet connections for up to six server grade payload boards and designed to optimize the Size, Weight and Power (SWaP) metrics of rugged server configurations. When used in conjunction with Concurrent Technologies’ TR C4x/msd, which is based on the Intel® Xeon® processor D-1500 and includes native 10 Gigabit Ethernet connectivity, solutions can include up to 96 Intel Xeon cores and 192GB of DDR4 memory. Target applications for compact, rugged edge servers include image and signals analysis, video encoding, simulation and communications systems. FR 351/m06 has a built in management processor and is configured from easy to use web pages accessed via a network interface or from a command line interface. High performance layer 2 bridging functionality is augmented with packet processing capabilities such as VLAN, multicast and Quality of Service which means that FR 351/m06 is a good choice for power sensitive deployments within controlled networks. It offers 80Gbps of non-blocking switching allowing for 10 Gigabit data connectivity across six VPX payloads plus two additional 10 Gigabit Ethernet SFP+ ports on the front panel of the air-cooled variant. 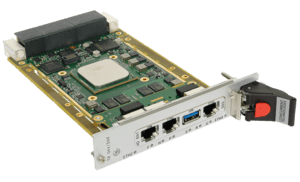 FR 351/m06 also includes a separate Gigabit Ethernet switch for control plane traffic, segregating management and user data for improved control and reliability. “This new switch enables our customers to construct server class solutions that can analyse, encrypt and transcode data in harsh environments. It has been designed in response to a number of customer requests to migrate applications from rack mount servers that operate in a data centre, to a smaller and more rugged format. This type of application complements our traditional solution of a switch and single processor at the centre of an I/O centric system”. First shipments of the air-cooled version of FR 351/m06 will be delivered in Q3 2016. Shipments of the VPX REDI™ rugged, conduction-cooled variant will commence after additional qualification testing for shock and vibration has been completed.